About a year ago Atari while trying to publish the legendary “RollerCoaster Tycoon” series for iOS, with RollerCoaster Tycoon® 4 Mobile ™ (AppStore) quite disappointed. The free download was cluttered with IAPs and other F2P game diseases that has made no fun and was absolutely disliked by the users in the AppStore. A completely different approach now trys Frontier Development Limited. Because RollerCoaster Tycoon® 3 surprisingly appeared yesterday evening on the AppStore and is a premium download as it is in the book. 4.99$ costs the universal app, it is completely free of IAP offers – laudable and correct in our opinion and the right way for a PC simulation classics in the modern time of mobile gaming. Do you have loaded the around 600 megabytes large universal app on your iPhone or iPad, the building fun can start already. Old hands (and probably everyone else) know that on the PC the highly successful series is about building a theme park. And thus the maximum number of paying visitors brought lures, you should not skimp on building attractions. You built spectacular roller coasters, one bigger and faster than the others. Whether your designs work correctly, you can test with a drive with the coaster camera. However, carousels, food stalls and Co should not be neglected, they finally let it ring in your cash register and so allow you to build additional rapid construction and viewer magnets, and sources of income, spread over 5 different themes (Standard, horror, Western, Adventure and Sci-Fi). In addition to the free sandbox mode you can also play the 18 scenarios of the original PC game. So we praise that, we like the iOS porting of classic PC games: IAP-free, good content and a nice 3D look. 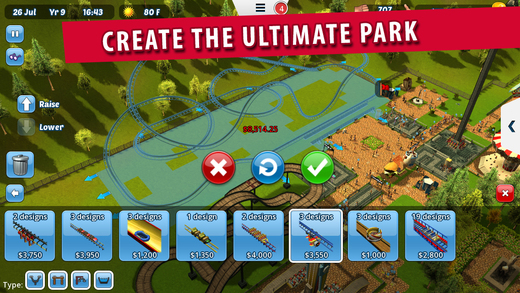 At first glance RollerCoaster Tycoon® 3 makes everything right here! 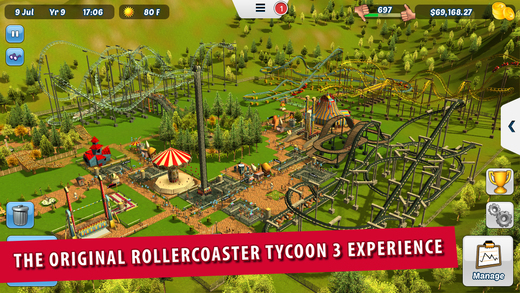 In the iTunes App Store RollerCoaster Tycoon 3 is available for 4.99$. Here the game for iPhone, iPad and iPod touch can be downloaded, but iOS 7 or later must be installed on your device. 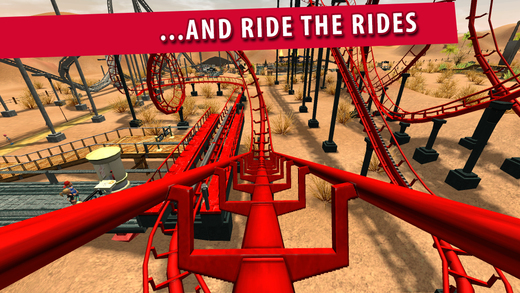 Be the first to comment on "RollerCoaster Tycoon 3: PC Classic & IAP-free for iPhone & iPad"